Yojimbo – Did You See That One? The Samurai (Mifune) has arrived in a town divided by rival gangs. Now he’s decided to play them against one another. Soon his efforts begins to serve his own needs as well as the needs of the people caught in the middle. This is a samurai classic from the legendary Akira Kurosawa (Seven Samurai). He not only directed this movie, but also assisted Ryûzô Kikushima (Throne of Blood) in writing the screenplay. 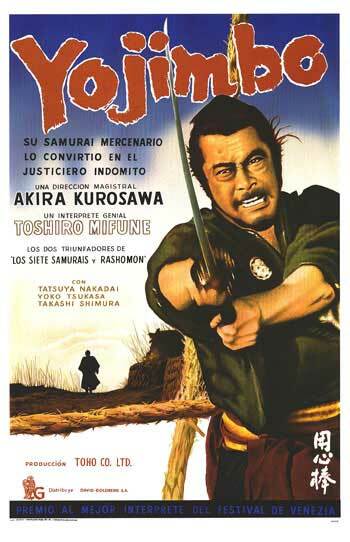 The film stars the legendary Toshiro Mifune (Rashomon). He’s joined by Tatsuya Nakadai (Ran), Yoko Tsukasa (The End of Summer), and Isuzu Yamada (Sisters of the Gion). This is a classic story that not only worked in this 1961 film, but also spawned a number of remakes and clones. The most notable of of these was A Fistful of Dollars. Kurosawa and Kikushima put together a story that’s a mix of comedy, action, and adventure. This one does a nice job of getting right to the good stuff. The introduction of the small town includes a small look at the weird and interesting people within. This one is written to have a great pace, but still takes time for comedic moments. The comedy comes from a range of characters instead of relying on one character. While this isn’t the dramatic masterpiece of Throne of Blood it still pays off on all the setups and works wonderfully after more than fifty years. The acting in this movie is wonderful. A wide range of great characters are created by the talented people in the cast. The shining star in this film is the incredible Toshiro Mifune. His performance is intuitive and entertaining, adjusting for the tone of each scene. He’s also got great chemistry with the rest of the cast. Actors like Tatsuya Nakadai, Yoko Tsukasa, and Isuzu Yamada all do incredible work throughout this one. The cast also handles the action sequences in the film nicely. The cast was instructed on the sword work by Yoshio Sugino of the Tenshin Shōden Katori Shintō-ryū and Ryū Kuze. Overall, the acting does all the right stuff with this cast. Cinematographer Kazuo Miyagawa (Ugetsu), a frequent collaborator of Kurosawa’s, worked wonders in this film. The pair of them used every chance they had to let the visuals tell the story. There’s an added depth to the film thanks to the intentional placement of everything within the frame. This film still looks incredible today thanks to the great efforts taken with the production. The movie earned an Oscar nomination for Best Costume Design thanks to the work of Yoshirô Muraki. The film also features a great score from composer Masaru Sato (The Hidden Fortress). This film is a masterpiece and a wonderful example of Kurosawa’s attention to detail. With the added power of Mifune’s performance this is a must-see movie. I can easily recommend this one to fans of foreign cinema as well as fans of the stars in the movie. This is also one that fans of A Fistful of Dollars need to know. I give this one 5 out of 5 stars. or were the prey of strong play. Best striking scene: the dog with a hand in its mouth in the middle of the street. So much good stuff in this movie.